This lake is a beautiful deep water lake (106 ft) in Northwestern Wisconsin. There is great fishing both summer and winter. It is also a great recreational lake with motor boating, jet skis and abundant swimming areas and beaches. The water is very clear and clean. It is surrounded by north woods and you will find the loon and great blue heron as well as abundant song birds. 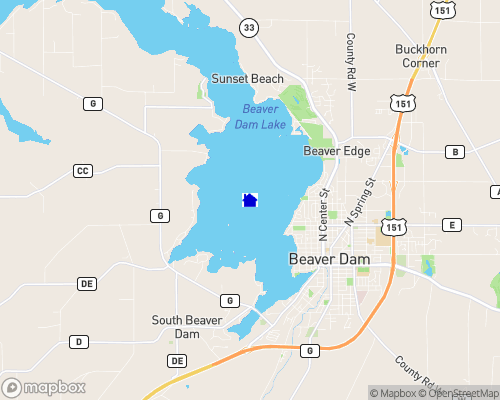 Beaver Dam Lake is an 1100 acre lake with maximum depth of 106 ft. It is a good fishing lake both summer and winter. Motor boating and jet skiing are allowed. There are several swimming beaches and most properties have good swimming from shore. So it is an overall great lake for all water sports. Winter offers great cross country skiing, snowmobiling and ice fishing. It is located less that 2 hours from the Minneapolis/St. Paul and is a popular spot for people from there as well as Chicago. The town of Cumberland is at one end of the lake and offers all the usual amenities as well as a first rate hospital. Water quality? Ranges from partly clear to turbid with algae. Nearby cities: Beaver Dam-0 miles, Madison-30 miles, Milwaukee-60 miles, Fond du Lac-30 miles.